Read this newsletter in a new browser window. Ian Washington will be running the 26.2 mile marathon to raise funds and awareness of ASNI's work. This is a huge endeavor, and we really need to support him with sponsorships for this run. Please support Ian and help our charity. You can donate via Facebook at the link above, or you may donate via our website and state "sponsorship for Marathon Man". Thank you, friends. Only with your help can we continue to do so much great work. We are dedicating this newsletter to Henry, the beloved soulmate of Suzy Alexander. Our newsletter dedication continues with to Mr. Paenthy, the sweet loving kitty of Caroline Vetter. We would also like to dedicate this newsletter to Totem, rescued by Renee Snyder and kept as her best friend. Our last dedication goes to Lola, the love of Lelia Leandra. Lola passed away from cancer. Lola was rescued from an irresponsible breeder. She needed a lot of vet care and tons of TLC. She turned out to be the most gentle, kind, loyal, sweet true friend; a member of our family. We loved her to the moon and back. Greetings to you and happy Spring! Romania Animal Rescue and Animal Spay Neuter International are extremely busy, so busy it is hard to put everything into a newsletter, but here goes! The new Romania Animal Rescue Center now looks like a real building. We are now in the process of raising funds for the final "bricks". Then onto the infrastructure, which includes heat/air conditioning, plumbing, windows, electric wiring, fencing, floors, ceilings, lights, tables, solar panels, Iso machines, paving, autoclaves, ultrasound machine, xray machine, and cages. This Center will serve Ilfov county surrounding Bucharest with an estimated 110,000 owned dogs, unknown number of cats, and many stray dogs and cats. It will be the Center for spay/neuter, Homeless Animal Hospital, Veterinary Training Camp, and Education Center. This hospital will also do highly skilled surgical procedures for customers as well as low cost spay/neuter for those who can afford to pay as well as be a general clinic for the community. This is the most important mission that RAR has ever taken on, and we need your support to be able to achieve this. This is an investment in the future of animal welfare in Romania! We are set to change the way animals are treated in Romania, and to lead by example. I hope you will donate to support this incredible venture whose time has come. HOPE the spaymobile has been busy serving small villages and individuals who have many animals and do not want more births. The upcoming Hopeython, led by Suzy Alexander, will be the first of its kind...an entire spayathon run with HOPE! Dr. Aurelian went to Finland to share his expertise on spay and neuter with local vets for Alma Help, Finland. Animal Spay Neuter Intl. was able to provide 222 spays and neuters in Bulgaria! What a great campaign this has turned out to be. The locals are embracing spay and neuter, while only this time last year they were reluctant. That's the change that is happening, thanks to your support! Bulgaria wants us back in September, and we hope to be able to return. Megara, Greece is desperate for Animal Spay Neuter Intl. help, and we hope that we can get your support to start campaigns there as we have now in Bulgaria. We started touring Romania at full speed once the weather got better. We closed the month with a spectacular number of surgeries and the next months of Spring are looking good for all of the animals we spayed and neutered and for the animals that will never be born. Every surgery is a long-lasting rescue. We all want to jump and save the puppy from the middle of the busy road but we might be too late. For the next one there might not be a place at the overcrowded shelter so what can be done? A lot can be done and one single surgery is a huge step forward for a world of no more homeless dogs. Speaking of a perfect world, we are making big progress with the building of our one of a kind Center of Hope. The roof is up and we started installing the ventilation systems and plumbing. There is a lot more to do but we are confident we will be able to open in October and perform the first surgeries in a brand new location. A landmark for animal welfare in Romania and Eastern Europe and a place where Hope lives. I think of it like a place where people come to recharge their batteries and feel that the world has a chance for the better. There is no greater power than the power of Hope. We are so happy that our Spaymobile has the name Hope. When you feel down but still have hope you are already half way through and this is vital for the work we do . Please continue to support our projects and spread Hope and the best thing to offer for so many animals in need. Locations: Bucharest, Craiova, Iasi, Moreni, Odobesti, Snagov, Tecuci, Vatra Dornei, HOPE campaigns, and with Animal Spay/Neuter Int'l. in Bulgaria! We need your support for this incredible Center to be built, for infrastructure costs, equipment, so we can begin to save more animals. Please help us to make history in Romania with the new RAR Center for spay neuter, Homeless Animal Hospital, Veterinary Training Camp, Education, and HOPE launch site for Bucharest area! Please help us to support this project. Thank you! If you are on Facebook, this site has been set up to fundraise and post updates. Thank you, Claudia Dörrig, for all your hard work! 222 animals were spayed and neutered! What a wonderful trip this was! Bulgaria is asking for our return again in September and it is our hope that we will be able to make this happen. HOPE, our mobile spaymobile, reaches places that formerly had no help. HOPE can go to locals residences, small villages, and remote locations. HOPE will be going to help an elderly woman with her 17 animals in upcoming days, thanks to funding by Yes We Can for HOPE! What is a Hopeython? A Romania Animal Rescue Spayathon, with HOPE! Suzy Alexander is organizing the first Hopeython to serve communities surrounding Craiova. Speranta Pentru Animale Craiova is the guide to locations. HOPE will have another successful mission under her belt, with the goal of 210 spays and neuters in very remote areas. One of the many reasons we must return to Tulcea. We have completed a spayathon of 100 animals in Tulcea. They have asked RAR to return to spay and neuter another 100 animals. Moreni, Craiova, Bucharest, Snagov all need sponsorships for campaigns, so we are asking your support. Megara, Greece is begging ASNI to return and set up a spay project there. While Homeless Animal Hospital treats hundreds of animals, we would like to share 2 stories with you. Meet Lucky, shot 19 times, and saved at HAH. Lucky is one of the fortunate few who, with the expertise of the veterinary team at HAH made it back from hell. She got to see the humanity’s worst side, but she is now taking baby steps in finding out just how great life can be. Read Anda Popescu's account of Lucky. There are more than 100 private shelters in Romania, some, just crowded back yards in the middle of a city/village. People became rescuers with no experience, only a passion to help as many animals as possible. But no matter how great the love and how good the management skills, time has no mercy—there are just too many animals to take care of properly without a preventing the influx of newborn animals exacerbating the situation. 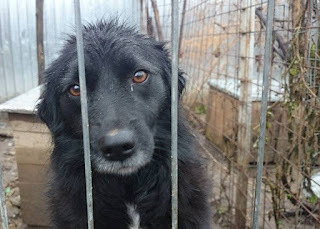 To find out more about Romania's shelter situation, read Anda Popescu's blog. Oops never had a name. She was born somewhere around a busy national road in Romania. One day she was watching the cars passing by. The next thing she knew, she woke up in a vet hospital. The veterinarians believe she had been run over by a car and her leg was crushed. A car stopped and picked her up and then rushed her to Homeless Animal Hospital that treat homeless animals for free! Despite a valiant restoration surgery, the veterinarians could not save her leg. Now she is a Tripod. After deparatization, she is still itching from the hundreds of lice that have been eradicated from her skin and has a few residual worms. She should be itch-free in a few days. To prevent future similar episodes from happening, we must stop the overpopulation of stray animals at its source. Spay/neuter is the answer. In the meantime we are holding Spayathons and saving the barking souls who get injured while living out their lives. The only way we can keep this vital work ongoing is with your generous support. Please help us with the Homeless Animal Hospital project, recipient of the Project of the Month Award, Global Giving, March 2015. UPCOMING: Two Bulgarian vets will travel to Veterinary Training Camp, Romania for intensive training by the Team. Thank you Elizabeth Elstob for sponsoring the training for these two vets from Bulgaria! Thank you to an anonymous donor who also sponsors vet training in memory of Sasha, the dog who died due to lack of good veterinary care. 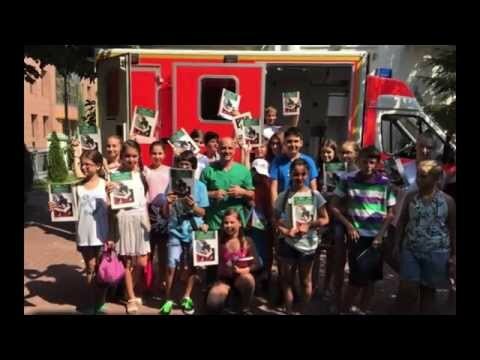 Romania Animal Rescue also sent education books to our friends in Brasov for their local school campaign. Thank you, Mayhew Animal Home and Global Giving, for sponsoring printing of the education books. Here is the Romania Animal Rescue/Animal Spay Neuter International booth at the Achen Festival in Germany. Birgitta brought her wonderful cookies to sell to raise funds for our work. Thank you so much for this wonderful help everyone. Thank you Anne Marie, Michael and Birgitta! Birgitta has also organized a Charity Dinner for us in Germany to raise funds for RAR/ASNI. Thank you so very much! UPCOMING: RAR/ASNI will run a booth at the HSUS Animal Care Expo in Las Vegas. What Goes into a Spayathon? Dr. Ruth Osborne made this video of what goes into an RAR Spayathon (watch the video). 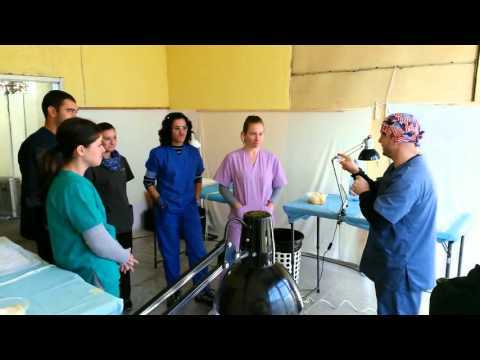 Our veterinary Dream Team went to Bulgaria to run a spayathon. While they were there they trained the local veterinarians on using modern high-volume spay/neuter techniques (watch the video). Our mobile clinic, named HOPE, travels throughout Romania providing state-of-the-art veterinary services to even the smallest of villages. Here is how HOPE has helped Romania (watch the video). To get up-to-date RAR/ASNI news, visit our Facebook Homepage. $20, Euro or British Pound will "buy a brick" to go towards sustaining the RAR Center. Donation opportunities to support our Spay/Neuter program. 1,945 members are finding great deals on items while supporting our programs. Weekly bonus ball £59 given to winner every week. Special and never ending thank you to our wonderful supporters and fundraisers who allow Romania Animal Rescue and Animal Spay Neuter International to help so many animals. With your support and compassion, we are able to help animals every single day. Thank you all from the bottom of our hearts! Soon we will have a new website up with information of who makes up the Dream Team, from our Board of Directors in USA, to UK Trustees, Vets and Techs, and the amazing Volunteers who work so very hard for the animals! Thank you to the best team of veterinarians and technicians in the world! dba Animal Spay Neuter Intl. For secure online payments, please visit our websites, romaniaanimalrescue.org and animalsni.org, and click on the Donations link. 72-1546354: All donations to RAR are tax deductible in the USA.